(Pronounced EE-guh-gick.) Egegik is located on the south bank of the Egegik River on the Alaska Peninsula, 40 miles southwest of King Salmon and 326 air miles southwest of Anchorage. The community is accessible by air and water. A city-owned 5,600’ long by 100’ wide lighted gravel runway with crosswind airstrip is located 2 miles northwest of Egegik. Scheduled and charter flight are available from King Salmon. According to anthropologists, settlement of the Bristol Bay region first occurred over 600 years ago. Yup’ik Eskimos and Athabascan Indians jointly occupied the area. Aleuts arrived in later years. The first recorded contact by non-Natives was with Russians fur traders between 1818 and 1867. 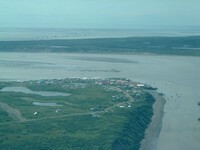 The village was reported by Russians as a fish camp called “Igagik” (meaning “throat”) in 1876. Local people would travel each year from Kanatak on the Gulf coast through a portage pass to Becharof Lake. From there they would hike or kayak on to the Egegik Bay are for the summer fish camp. In 1895 an Alaska Packers Association salmon saltery was established at the moth of Egegik River, and a town developed around the former fish camp. During the Influenza outbreaks beginning in 1918, natives from other villages moved to Egegik on an attempt to isolate themselves from the disease. During World War II, men from Egegik were enlisted to help build the King Salmon airport, with many subsequently serving in Dutch Harbor and elsewhere. Today, the economy in Egegik is based on commercial fishing and fish processing providing seasonal employment from May to August. The population swells by 1,000 to 2,000 fisherman and cannery workers during the commercial fishing season. Five on shore processors are located on the Egegik River and numerous floating processors participate in the Egegik fishery. Local working tours of the Bristol Bay set-net fishery are available. The Becharof National Wildlife Refuge and Becharof Lake are accessible from here by plane or skiff up the Egegik River where sport fishing, hunting and wildlife are popular activities. The Becharof Lake is the second largest Lake in Alaska and is the nursery for the worlds second largest run of sockeye salmon.